Blankenhole - Brian Enos's Forums... Maku mozo! Football, Coaching, Shooting, Loading, Electronics and any other activity that I can use my hands with. In my experience that's about 8 seconds too long! 10 seconds is a LOT of one shot! Agreed, I just give a few quick sprays, oneshot is some powerful stuff. I always use lube even with carbide dies. After trying without then running with, I will never go back. It is so smooth. Back to the issue at hand, make sure the die and machine setup is right and clean. A quick spray in a bag or even on a tray (very messy) will be more than enough and it should run great. Not sure what you are shooting out of, but I had to load a little higher than was recommended on the Hodgdon site to feed reliably in my 4.5" XDm 9mm. 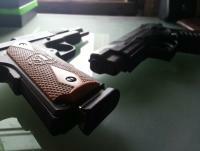 I have a 9mm XDm but a friend of mine has the .45. Any and everything I have loaded up, it ate pretty good. I can't think of a single bullet profile that it didn't care for (in 9 or .45) at any weight unless I made them a little too long. Feed it! Great shooting gun. I was given some old surplus ammo boxes I store bulk in and I have about 4 100rd Cabela/MTM/WhereeverIWentAndBought ammo boxes for a few bucks I each that I load up to take out to shoot. +1 on the OneShot with the freezer bag. I tried One Shot after using RCBS pump spray and I found it to last a little longer and it runs great. 5.2 is a good starting load, any lower and you will run into feed issues. 5.2 is still a little too low to feed reliably in my xdm. I found my ideal load for 124gr with PP was 5.5-5.58gr. I had it written down somewhere, can't seem to locate it right now. I am almost ready to get back reloading. Look at some shotgun powders for pistol loads if you can't find pistol powder, lots of them can be used quite well in .45. IMR PB would be my first pick and still commonly available in my area at least. You can find lots of load data for pistol cartridges from some primarily shotgun powders. Bad time to get into reloading? I started around the same time and it has gotten better since then (at least in my area). I carry the same mindset, better now than never as well. Even if you can't get everything you need to load as much as you want, even a little is fun and satisfying. 700x, like most flake powders similar to it, do not drop well at such a low amount. I imagine if you would weigh each drop at what is supposed to be 2.5gr, you will be all over the place and usually under 2.5. I would say trickle it or keep it at 3.0gr if you made that consistently work. My two biggest pieces of advice are to keep the hopper as full as possible and do not use the powder baffle. On another thread somebody spoke of hooking an electric toothbrush up to their hopper and was happy with that result as well. 45ACP powders used... What have you used and how? I floated around 5.0gr with a 200gr LSWC @ 1.225" with good results.